Maybe an added incentive for keeping interest rates higher is to keep the AUD high enough to maintain price stability or reduce price inflation on consumer goods included fuel. .... Our exchange rate is the only thing stopping fuel going through the roof. Can you imagine if we went back down to 60 cents? We'd be paying $2/L just like 2008. I hope so, I've got some decent money in oil stocks that wouldn't mind the price of crude oil going up! Blimey, Steve McKnight telling investors to get rid of non performing property at 'today's good prices'. I thought the mantra was to buy and hold long term. Terry Ryder saying today that there is no undersupply in Perth. What is going on, is the worm slowly turning? AUSTRALIA'S fifth-largest retail bank, ING Direct, yesterday increased the rate on its standard variable home loan by 30 basis points to 6.49 per cent. It's still about .5% cheaper than the Big 4, but it's the first above-OCR rise I've seen so far. AUSTRALIAN home owners could soon face mortgage rates almost as high as at the peak of the economic boom, as the major retail banks maintain their margins despite concerns about the strength of the consumer sector. Analysis of the standard variable rates at the top four banks carried out by The Australian shows lending rates are between 274 and 301 basis points above the official cash rate of 4.25 per cent. etc etc. The graph is worth a look. Basically, as rates fall, the banks don't lower as muh as the OCR changes. As rates rise, banks go higher. The rate at which people can borrow from banks is still low- just not with the Big 4. I am seriously wondering why people would use the Big 4. On http://www.infochoice.com.au/home-loans/variable-home-loans/ (untick sponsored listings), there are 20 listings for variable home loans (comparison rates) of 5.94% - 6.19% (all credit unions and private companies). The big 4 are now about 1% higher than other loans. I know people say they can get a .7% package discount from the Big 4, but discounts can probably be had from smaller providers, too, such is the competition in the market. So, back to the article. It's a bit alarmist to suggest home loan rates will be back at their levels of around 9.3% when we can still get variable rates around 6%. That's 13 rises of .25%. No doubt some providers will continue to raise outside of RBA announcements or just lift when they feel like it, but it will be a few years, imo, until we get back to 9.3%. Also, even when some providers (the Big 4 probably) will move to those levels, there will always be others who don't. I'm starting to think Frank was right, Plonk. 2012 - 2013 hold onto to your equity hats, Australia is going to nosedive and America is going to be deep in depression. Two things to contribute, I reckon, ummester: higher IR's and banks tightening LVR's. We can borrow less, sellers can't keep charging more; and Moodys will sit on banks harder, so they don't just lend on housing (I think ANZ's recent tightening is an aberration, personally). I imagine some of the FHB's and others who bought into property during the GFC, were encouraged- by banks and brokers- to go to the Big 4 because people had a mistrust of the financial system. now they are lumped with higher loans, and the providers didn't collapse after all. If I pass through this cycle and just keep saving, I'll know if rates crash again, to lock in a low 5-year rate. I doubt our rates will *ever* go to zirp. We don;t have that kind of Reserve Bank. As an aside, Stevens only has a few years left to his tenure (he finishes in 2013). I wonder who'll follow him and if they'll do things slightly differently. I don't like the idea of zirp. Because we fund so heavily from overseas, Zirp is off the table at this point in time. There are too many black swan variables to consider as to where Australia may end up. If/When China implodes anything is possible but there will be bigger issues abounding than just the OCR. An Israeli strike on Iran and $200 oil. The best deal IMO would be -4% pa fall per year for 10 years. Most Australians would be too dumb to notice and panic (mass sell off destroying the wider economy). Look at Sydney over 6 years. Tell a Sydney owner that bought in 2004 until mid last year their bricks and mortar ATM hadn't made a dime and had lost big time due inflation and he'd call you mad. A mass sell off will destroy the economy - 15% unemployment, civil unrest, deflationary spiral etc. -4% pa for 10 years will give you, in 2020, -34% in real terms ( 100(0.9610) ) and -50% adjusted for inflation ( 74.6(0.9610) ). There are so many things to consider and, other than the black swan scenarios of tin's, there are demogrphics and how that will effect supply. I still think there are a lot of established places that will be released onto the market over the next 2 years, places purchased on boomer equity. 2009 saw many of these types of places come onto the market but not all. I am still totally bemused by the increase in available rentals near me that aren't new builds. Who was in these places last year? Unless ther has been some kind of Canberran exodus, I am going with them as being empty houses to keep them pristine and fetch the best sale price possible. I am seriously wondering why people would use the Big 4. The reason is ATM access. Non-banks should cooperate and build an independent cross-funded "zero-fee for members" ATM network. Non-banks should also standardise their online banking. The fine print of some non-banks is also evil. MORTGAGE rates are predicted to hit a horror 10 per cent within two years as the Reserve Bank hikes rates to prevent runaway inflation. Leading economists say soaring commodity prices and rapidly rising employment are stoking dangerous inflationary pressures that the RBA is determined to stamp out. As a result, economists at Macquarie Bank and Commsec, the Commonwealth Bank's investment arm, have both forecast the cash rate will hit "pre-crisis highs" of 7.25 per cent by 2012. Since banks have expanded their profit margins in the downturn, that translates to a variable mortgage rate of 10.1 per cent - the highest since 1996. The news will strike terror into many home owners, especially those who stretched to afford a property when rates were at record lows last year. If rates do hit 10 per cent, a borrower who took out a $300,000 mortgage when rates bottomed at 5.75 per cent last year will see monthly repayments rise by $839 a month, from $1887 to $2726. Even at 9.5 per cent, the same borrowers will see repayments rise by $734 a month. Rory Robertson, interest rate strategist at Macquarie, says a booming labour market could force the RBA's hand. "If the economy keeps on growing like this, we will hit the previous highs in the cash rate," Mr Robertson said. "We already have a template of what happens when the economy grows strongly - we saw it before the Lehman Brothers collapse in 2008 - so we know how the Reserve Bank responds to the threat of inflation. "It hiked aggressively back then, and it is doing the same again now." Savanth Sebastian, senior economist at Commsec, agrees. "If iron-ore and coal prices continue to rise, we can expect the cash rate to revert to its pre-crisis level," he said. Yeah, I meant for home loans, though. I don't like the thought of a card being attached to a home loan. i knew redraws were really easy. but can you really get an atm card directly against the home loan? no wonder people get themselves into trouble. i guess it's no different than racking it up on credit card and then redrawing 'just this once'. Not sure, zaph. Her'e the sequence. I said Big 4 profiteers -> sydney3000 saying Big 4 useful for ATM's. I think sydney and I may have been speaking at cross-purposes. Maybe not though, and I am not sure if home loans have ATM access. I doubt it. Redraw is a similar kind of debt to an ATM card, I guess- it's paying down debt ahead, then redrawing it back, so it takes longer again to repay the loan. If IR's move close to the 10% of the above article posted, I imagine some would be hoping they're far enough ahead in the loan to rely on redraws until they get a wage rise or until rates lower again. Somehow, I doubt that many FHB's will be too far ahead. Not many people thought IR's would be raised so frequently so soon. How hilarious, if the ABS ha been tweaking stats to keep their jobs by appeasing the government. ABS started reporting on distinct full time income in 1980s - before then it was just one figure. Through the 80s and 90s we got seperate figures for FT and NFT. In the 00s only FT wages are clarified, though you can get the difference of all earners to see the NFT wages. Media runs with FT wages as being the average Aussie income for the last few years of this housing bubble, RBA buys it and skyrockets IRs. Meanwhile, all the buyers from 2009 are probably only on average incomes, 40-50 K PA, perhaps co-signing with a 30-40 K PA earner, leveraged with their FHBB and a bit of help from Mum & Dad. They might have to look for $2700 PM, when they are only grossing $6250, or clearing around $4300, in a better case scenario. Not hilarious for them. But hilarios just how badly a country can be mismanaged when everyone in power only has selfish, short term goals. Modelling by Fujitsu Australia, which runs a "mortgage stress" index, suggests 1.1 million households will struggle with repayments if mortgage rates hit 10 per cent. But it says house prices would be supported by almost-full employment and a continuing shortage of properties. "Prices would only suffer a small fall, they wouldn't crash," said Martin North, director of Fujitsu Australia.However, others warn the flood of first-home buyers - lured in by generous government incentives - will struggle so badly, they will be forced to sell, leading to a rapidly deflating property market. AMP chief economist Shane Oliver said such high rates would lead to a big rise in delinquencies, and prices would fall by around 10 per cent. or 370 per week left. that's do-able. but they better like dog food, because cat food is gonna break the budget. I said Big 4 profiteers -> sydney3000 saying Big 4 useful for ATM's. I think sydney and I may have been speaking at cross-purposes. There is no direct link between an institutions home loan offer and ATM access. The point is people are hesitant to strike up any relationship with an institution which offers no ATM network. The non-banks can scream bloody murder about their lower fees, lower mortgage rates and better face-to-face service. No ATM network means no 21st century participation means no business. Considering that all non-banks are in the same boat you would figure they have the clue to build their own ATM network. If the government does turn Australia Post into a financial services branch and ATM network then you can kiss your other non-banks good-bye. They are asleep at the wheel. Why exactly do you need an ATM with a home loan? Its not like home loans are ordinary transaction accounts or anything ... I had a loan with the ANZ for years and it was only the loan, no transaction account, no cards, no nothing. MORTGAGE rates are predicted to hit a horror 10 per cent within the next two years as the Reserve Bank hikes rates to prevent runaway inflation. As a result, economists at Macquarie Bank and Commsec, the Commonwealth Bank's investment arm, have both forecast the cash rate will hit "pre-crisis highs" of 7.25 per cent by 2012 if the economy continues to perform so strongly. Since banks have expanded their profit margins during the financial crisis, that translates to variable mortgage rates of 10.1 per cent - the highest since 1996. "The banks' margin above the cash rate has crept up to almost 2.90 per cent," said Josh Williamson, chief economist at Citibank. "So the cash rate doesn't even need to rise as high as last time (for mortgage rates) to hit double figures." Rory Robertson, Macquarie's interest rate strategist, says a booming labour market could force the RBA's hand. 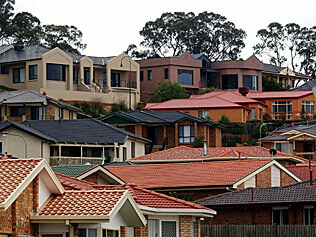 "If the economy keeps on growing like this, we will hit the previous highs in the cash rate," Mr Robertson said. "We already have a template of what happens when the economy grows strongly - we saw it before the Lehman Brothers collapse in 2008 - so we know how the Reserve Bank responds to the threat of inflation. It hiked aggressively back then, and it is doing the same again now." Savanth Sebastian, senior economist at Commsec, says if iron-ore and coal prices continue to rise, we can expect the cash rate to revert to its pre-crisis level. "The makings are there for a repeat of the commodities boom that we saw between 2003 and 2008, and rates will likely hit, or exceed, previous highs in this cycle." The news will strike terror in many homes, especially owners who stretched to afford a property when rates were at record lows last year. If rates do hit 10 per cent, a borrower who took a $300,000 mortgage when rates bottomed at 5.75 per cent last year will see monthly repayments rise by $839 a month, from $1887 to $2726. Even if rates hit 9.50 per cent, the same borrowers will see repayments rise by $734 a month. Mortgage brokers have urged potential buyers to factor in at least another two percentage points of rate hikes into their calculations before deciding how much to borrow. But it says house prices would be supported by almost-full employment and a continuing shortage of properties. "Prices would only suffer a small fall, they wouldn't crash," said Martin North, director of Fujitsu Australia. However, others warn the flood of first-home buyers - lured in by generous government incentives - will struggle so badly, they will be forced to sell, leading to a rapidly deflating property market. I have my eftpos card linked to my offset account. Is that what they are talking about? Good to hear that lots of people will be in trouble at 10%, I figured I would aim for 20% being my crawl up and die point on the basis that by then everyone else would have failed and the bank would let me pay 19% rather than take yet another home and sell it for nothing. Aren't most variable mortgage rates around 7.25% at the moment? I'd doubt we'll see 10% variable mortgage rates by the end of 2010. Happy to be proven wrong on this though. I think the journalist meant to write "by 2012" not 2010. Even then, ten bucks says it won't happen. If any of the growing Black Swans with 10ft wingspans* take flight we could be 2% in 2012. There will be property crashes, equity crashes, bond market collapses and as close to zirp as we can get being heavy overseas funders. Steve Keen might moonwalk to Kozzy. Maybe Rudd will get us into a 15% deficit to GDP ratio to save it but the country will be f*cked for two generations. These things are hardly black swans anymore are they? Is it just my hatred of that catchphrase or is the very definition of Black Swan "something no one expected".